Two romantic ghost stories, one contemporary and one historical, of love lost but life treasured. Sometimes truth is only discovered in death. In an old riverside town, ghosts abound. Every Halloween the Ghost Tour trolley driver regales passengers with local lurid tales. But the reverend refuses to allow his haunted steamboat gothic chapel to be part of the tour. He doesn’t believe in ghosts or the whispered curse that hangs over his chapel. Nor does his wife until she sees the “Ghost Bride” on Christmas Eve. She knows she must find peace for the silently screaming woman in white. “Serafina,” an old-fashioned ghost story, recounts a tale of love more powerful than death. One winter night on the high plains, a young man witnesses the creation of a masterpiece in oils by his best friend and Serafina. Their lives are changed forever in ways never expected. 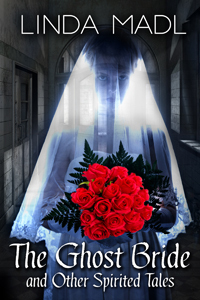 For lovers of romance and ghost stories. View more books in the genre "Ghost Stories". View more books in the genre "Historical Romance". View more books in the genre "Latest Releases". View more books in the genre "Paranormal Romance". View more books in the genre "Romance".